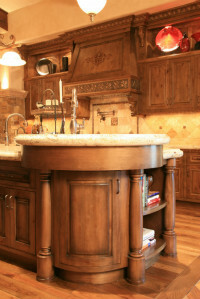 Optima Production Group, LLC is a local custom / semi-custom cabinetry and millwork manufacturer. We have been providing specialty cabinetry, millworks, and furniture piece to the Phoenix area for over 7 years. We have served client needs from the basic TV faceframes, to one-off furniture pieces, to complete cabinetry and millworks packages for luxury homes. Typical clients include homeowners, remodelers, designers, A/V companies, home builders, and commercial general contractors. You can expect us to provide you with high quality fabrication of cabinetry and millwork products for customers who require excellence. Our experience covers face-frame (inset and overlay), and euro construction…from whole house cabinetry, to custom furniture pieces, to passage doors and trim, to that one-off specialty woodworking piece. In addition to providing you with computer aided designs for your review and to assist in the preparation and installation process, we also have our own finishing department and are able to provide a quality and consistent finish for all cabinetry and millwork throughout the house. Do you have any questions? Ask them here! Select any of our portfolios above or select from the main menu bar. For each portfolio, you can see a larger image by selecting the "Full Screen" icon on the lower left corner of the portfolio. Press "esc" to return to your regular screen.